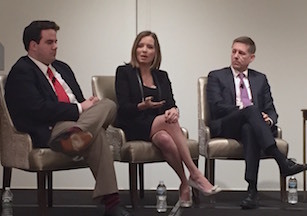 From left: Robert Costa, Kristen Soltis Anderson and Trevor Thrall talk about the challenges of covering the new Trump administration. Donald Trump spared no time battling the American media. Not only did he call the media “dishonest” the first day after taking office, but Sean Spicer, his press secretary, held the first briefing to accuse the media of “deliberately false reporting” on the inauguration’s crowd size. A panel of media professionals shared their back stories with reporters and journalism students at a PressReader forum on political coverage recently in Washington. PressReader is a Canadian-based news community that offers all-you-can-read news access to newspapers and magazines around the globe. Rick Klein, political director of ABC News, said it was the variety of experiences that drew him into the business. “There’s something about the ability to go and ask questions of people and experience things and learn something that to me is always compelling,” Klein said. “We’ve never seen anything this bizarre in our lifetimes, where up is down and down is up and everything is in question and nothing is real,” said Lewis, the founder of the Center for Public Integrity and the author of “935 Lies: The Future of Truth and the Decline of America’s Moral Integrity,” a book about presidential deception.